It seems long overdue a movie being done of the classic comedy duo Laurel & Hardy. I vaguely recall catching either old movies or shorts on TV as a kid and loving their rather innocent and charming approach to often slapstick humour. Both of them had a great personality that worked well together, and seeing anything they did even now still raises more than a few chuckles. There is something timeless about them that I think unlike many other acts like Charlie Chaplin or the Three Stooges, hasn’t aged all that badly. This movie follows the comedy duo as they reunite after a period of retirement to do a tour around England and Ireland in an attempt to finance a new movie. However following an incident during the height of their career, it soon becomes obvious there’s some bad blood between them. Steve Coogan and John C Reilly take on the rather intimidating task of bringing such figures to life and I am both happy and amazed to say they achieve it to an incredibly uncanny level. 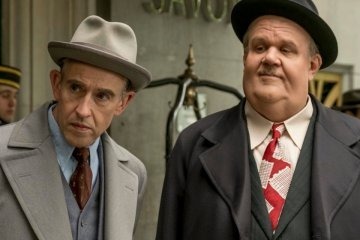 Coogan nails the expressions, the mannerism and even the walk of Stan Laurel and Reilly is just perfect as Hardy despite some prosthetic make up effects (which are done brilliantly). The relationship between the two is perfectly observed, touching, a little sad but also amiable and funny. You get a good idea who these guys really were and how they both respected each other, at times loathed each other but ultimately loved each other. Set mostly in England you get none of the Hollywood glamour and more so the has-been stage of their lives, of two stars struggling to hold onto the magic and keep themselves relevant. A squabbling duo of wives adds some fun personality, a money hungry agent also adds flavour and overall this is a charming and fascinating movie. As a Laurel & Hardy fan I would have appreciated more of a glimpse into how they came to be, or just a snap shot of their fame. The focus on the later part of their career makes for a good story that granted, tugs at the heart strings … but as much as I really enjoyed this, I came away feeling it wasn’t the full package – especially for those unfamiliar with their legacy Otherwise a heart-warming, funny and brilliantly acted look at two comedy legends. This entry was posted in Celebrity, Cinema, Comedy Reviews, Drama Reviews, Hollywood, Movies, Music, Reviews and tagged Comedy Duo, Hollywood, John C Reilly, Laurel & Hardy, Oliver Hardy, Slapstick, Stan & Ollie, Stan Laurel, Steve Coogan by Craig M. Bookmark the permalink.